atouvap.fr • Consulter le sujet - LES BONS PLANS de 3FVAPE en OCTOBRE ! Re: LES BONS PLANS de 3FVAPE en OCTOBRE ! The AV Circus clone Mechanical Mod is made from brass and powered by 1 x 18650 battery. The fixed 510 hybrid top is machined into the mod for enhanced conductivity. There are 4 vent holes on the top of the Double Cross mod. 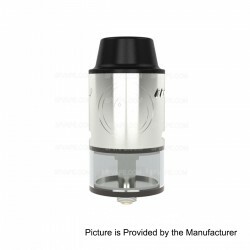 The NXS Clone RTA is made from 316 Stainless Steel and glass tank with 3mL. Easy top-filling system; Pyrex glass tank; Bottom air flow design for incredible flavor output. 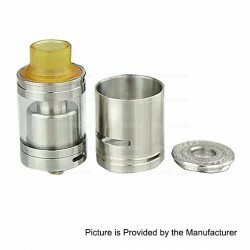 Battle Deck RDA: 510 threading connection; Brass cap; Stainless steel triple-pole deck; Diameter: 24mm. The Petri clone Mechanical Mod is made of brass (button) and aluminum (battery tube). It is powered by 18650 battery (not included). It is constructed from stainless steel and in 22mm diameter. The RDA is with dual-pole design and adjustable airflow control. This Resin drip tip is suitable for SMOK TFV8 Cloud Beast Atomizer and the Goon RDA with 1/2 inch drip tip connector, features 17mm length and 14mm outer diameter.tomizer, Suitable for SMOK TFV8 Cloud Beast Atomizer, Kennedy and the Goon RDA with 1/2 inch drip tip connector. The newest Coil Master DIY Kit V3 is a perfect all-in-one kit for DIY users.Packing list(included):1 x Diagonal pliers, 1 x Needle-nose pliers, 1 x Stainless steel folding scissors, 1 x Pen styled Phillips screwdriver, 1 x Pen styled Flathead screwdriver, 1 x Ceramic Tweezer (T1), 1 x Elbow Tweezer (T3), 1 x 10ft 24GA Kanthel A1 wire, 1 x 521 Mini Tab (powered by 1 x 18650 battery, not included), 1 x Coiling Kit V4, 1 x Silicon rubber case for jigs, 1 x T styled HEX screwdriver (1.25mm, 1.5mm, 2.0mm), 3 x Japanese Organic Cotton. The original ETALIENS AIMIDI CUBE 75W TC VW Box Mod Adopts Authentic Evolv DNA 75 Chip. The mod is built-in large 0.91 OLED screen for convenient use. The Cube 75W supports Kanthal, Ni200, Titanium, Stainless steel wires.There are different color for you to choose. The Original AIMIDI ETALIENS E.T-X3 75W TC VW Box Mod Adopts Authentic Evolv DNA 75 Chip. The mod is built-in large 0.91 OLED screen for convenient use. The Cube 75W supports Kanthal, Ni200, Titanium, Stainless steel wires.There are different color for you to choose. The original Aimidi Extreme RDTA is constructed from stainless steel and glass tank with 6.2mL capacity,Diameter: 25mm. There are different color for you to choose. The Original Aimidi Stargate RDTA is constructed from stainless steel and glass tank with 6.2mL capacity. 510 threading connection; Diameter: 25mm. There are different color for you to choose. The Original ETALIENS AIMIDI CUBE 75W TC VW Box Mod Adopts original Evolv DNA 75 Chip. The Extreme RDTA Kit is built-in large 0.91 OLED screen for convenient use. The Cube 75W supports Kanthal, Ni200, Titanium, Stainless steel wires.The Kit comes with Extreme RDTA Atomizer. The RDTA is constructed from stainless steel and glass tank with 6.2mL capacity.There are different color for you to choose. The original AIMIDI ETALIENS E.T-X3 75W TC VW Box Mod Adopts original Evolv DNA 75 Chip. The mod is built-in large 0.91 OLED screen for convenient use. The Cube 75W supports Kanthal, Ni200, Titanium, Stainless steel wires.The Kit comes with Stargate RDTA Atomizer. The RDTA is constructed from stainless steel and glass tank with 6.2mL capacity.There are different color for you to choose. The SMOK H-Priv, which max power can up to 220 watt; the Red Triangle design would help you forget the fire key from now on: holding it, vaping it. The fire key of H-Priv is based on the design of X CUBE; it combines the inconspicuous fire key with the mod box instead of the cool customizable LED. The SMOK Micro TFV4 Tank features 2.5 / 3ml capacity and 0.3 resistance that can support 30~60W power output. The top refill design makes filling as easy as it gets.